PAUL DERVAN: I'm still the mayor. It's true. I've been the mayor of the coffee dock in O2's offices for the past week or two. Well, Kevin has tried to steal my spot on occasion, but he gets distracted by the authentic Il Valentino coffees every morning - of which he claims he is mayor of. And you can only have so many coffees in one day. Geo-tagging itself is interesting. 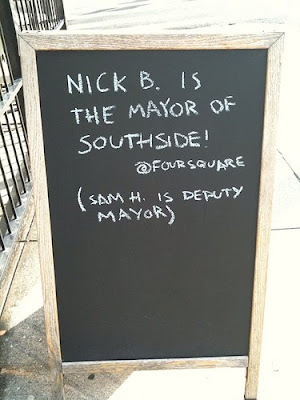 But foursquare is more - it is also playful. It will be interesting when shops, pubs, restaurants and other venues here start using it. Yes to reward customers and their buying behaviour - as both Damien Mulley and Kevin Dunne talked about recently. But also for a bit of fun. One of the funniest things I saw in the US was employees of a fast food outlet playing paper-rock-scissors with customers. They played double or quits for an extra burger or chips. Funny stuff - that gets talked about. I stole the idea and did something similar for call credit in our stores a couple of years ago. This playfulness works beautifully with foursquare. And will help companies show their personal side. And bringing together the real humans working for the brand with the real humans buying the brand is one of the things I think digital is perfect for.